Sit side-by-side in the Sundance® Marin™ spa. Play your favorite music from the optional stereo. Enjoy the cascading, softly lit splash of the AquaTerrace™ waterfall. The Marin spa is a relaxing place to carve out space and time for yourselves. 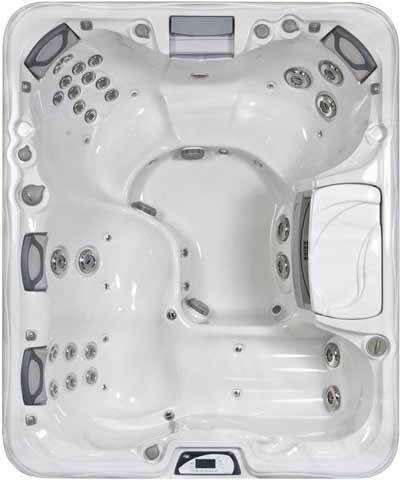 A Sundance 880 Series Marin spa gives you the luxury of a private retreat, perfect for enjoying warm moments. With its impressive selection of seven different types of jets, strategically placed in each seat of the spa, Marin provides any number of types of massage options. Soothing, calming, invigorating… set the mood inside the spa, Marin is whatever you make it. The Marin is also easy-care, thanks to its MicroClean® Filtration System and CLEARRAY™ Water Purification System. Dimensions - 6'3" x 7'7" x 33"